PeterHow brought a small single-board oscilloscope and a signal generator. Hasn't quite cracked it yet. He also has designed a cardboard case for R. Pi Zero, an impressive fusion of origami and scalpel-work. PaulE has developed a programmer for the ATtiny. Today it erased the uP successfully. Paul also showed a pic of the stage prop bomb-with-electronic-timer. Nigel dropped in and donated to us a Geeetech I3 3D printer. It's a Prusa I3 look-alike. The wiring needs a bit of tidy-up, but it could become our No1 work-horse 3D printer. Thanks Nigel. Lucille and Teo made their first visit to us. Teo is a younger person very keen on creating objects and gadgets. He's also familiar with coding in Python. Today, PeterHow showed Teo how to solder, and he connected up a DC-DC converter to drive a 12v LED, making a projector. We got out the PDS120 Scroll Saw from under the CNC machine. Too long it's been hidden away after breaking a blade. Dave found it has two spare blades and fitted one. Now there's a scroll saw (in the kitchen) for lightweight sheet material cutting. PeterH came along with a part-built Alien Fighting Machine (from HGWells novel 'War of the Worlds'). IanB had cut some parts in brass sheet for this machine. When he tried to cut parts in copper, the milling bit snapped, so we need another. The alien invasion has been delayed. PeterH also donated a Drill Sharpening set to us, thanks. This is a complicated electric-driven thing that Yaroslav will (probably) take a look at. Dave wants to 3D print a replacement end for an electric bike battery. The difficult part is modelling the shape in software. IanB gave a hand, but this is going to take a while. Garret came along with some ideas. He was going to bring The Internet with him, but somehow it got left behind. Despite this, we all managed to get by. MartinL has got a lovely old bakelite Bush valve radio, from the Richmond Cafe (on Richmond Hill). He's going to get it working again, and consulted IanB about electrical safety. The answer is: it's not safe to touch it. But enclosed in the bakelite case with plastic knobs on, no problem. Yaroslav laser-cut a picture frame which he had designed. Despite using known speed and power settings, the laser couldn't cut through 3mm acrylic in one pass. It may be losing power again, and in need of TLC. Who's going to take on that challenge? Jane took apart a weather station and extracted a 7-day clock. Didn't see much of what was going on this week, as I was shut in the CNC room trying to mill a sheet of brass. Jane was trying to find a way to attach wooden parts together, and she received advice and assistance from several members. PeterH brought sheets of brass and copper to be CNC milled. Being guided by IanB wasn't much good as Ian knows next to nothing about milling. Phil, Barry and others watched some of the milling process. Garret and IanB discussed plans for the Dr Nim machine mentioned last week, and possibly a Shannon mind-reading machine. Some biscuits were eaten, but several new packs remain. Thanks for the choc crispy things, someone. Nice how people contribute biscuits for the MakerLab community. This week we had something of a surfeit with two packs of choc digestives, Oaty biscuits, choc crispy pieces and salted caramel tea-cakes. The excess packs have been stored in the kitchen and we will probably get through them in the coming weeks. Garret made a glue repair to a Swiss Army knife style of camping cutlery, and started to look at making a larger version of the Dr Nim machine, with IanB. MartinC continued what he was doing last week. Welcome to Barry who joined us for the first time this week. PaulB was around, and helped Jane with her wooden legs. Jon started drilling another jam tart tray, but it didn't go at all well. The CNC used up three 2mm drills and again lost its X-Y position. Something there needs investigation. ChrisR laser cut a piece of 3mm MDF for use as a form tool. PeterHow experimented with the laser cutter, to see how finely it could cut. Jane put finishing touches to three pewter fishes and a pewter-cast stone mount. Jules cut a disk from brass sheet. Carla laser-cut some designs and produced a card-box. PaulE investigated the new ATtiny microprocessor range and successfully programmed one of them. Garett discussed with IanB the Doctor Nim game and the Shannon-Hagelbarger mind-reading machine. Jon drilled a large number of 2mm holes in the base of a jam tart tray. It went well. Martin did something more to the model ekranoplan and started to look into ways of milling a solid guitar body from a wood block. Carl brought a bicycle pump which he had repaired after it had been discarded. The pump becomes one of the RML tools available for members use. Carl demonstrated a 'mains power failure alarm' which he had put together from an obselete mobile phone. It sends a text message when power fails, and another when power is restored. The alarm will be installed at Meadlands school for monitoring the school's heating system. Kevin used the microscope searching for evidence of ear mites in a cat. He didn't bring the cat. Garret had a new game of Nim, a clever mechanical computer, with ideas of scaling it up to work with marbles. He also took apart a popcorn maker out of interest to see how it works. As a result, we now have a plinth to place the donations dish in plain sight. 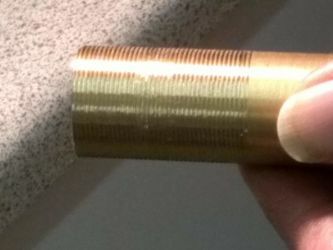 Jules spent some time on the lathe, turning a piece of brass, and afterwards using taps and dies. Jane modified a couple of right-angle brackets into 22-degree brackets, then added M4 bolts. Peter activated his 4-motor tracked vehicle and we watched it manoeuvring over chunks of wood and other obstacles. Martin brought half-choc mini-donuts. Not at all bad. Carla had purchased laserable rubber sheet. The laser cutter can produce rubber stamps from this rubber sheet. Carla made a couple of stamps and generously donated the sheet to RML. Now we can forge our own visas and travel to Europe whenever we want. ChrisR and Ann brought in a poorly Win7 laptop. AndyH took on the challenge and improved it greatly. Thanks, Andy. We met Ian, a retired person who was interested to see what we do, and who might look in again. MartinL discovered why his MOSFET wasn't switching and will see what to do next. Kevin and Sufiyo discussed plans for adding a shed to the yard at Little House, for Friends of Ham Lands to keep their tools and equipment. Mark came in to look at the thread-cutting drive on the lathe, and found out why it wasn't working as it should. PaulB was around for a time. MartinL chatted to IanB about alternative techniques for additive manufacturing. MarkW had brought some thermoplastic beads to show to ChrisR. He poured boiling water on them and they turned into a malleable sticky mess which cooled down into something very solid. Peter fitted batteries to a mechanical crab brought along by Jane. Crab walked towards mousetrap. Jane's making good progress with her wooden construction. Notches were cut into the top bar to accommodate a curvy piece of wood. Hi to new member Jules who came along to see what we do. Jules is a retired person, has plans to turn brass rod and work in brass generally. He has offered a demonstration, showing how to cast pewter, and how to make hot metal moulds. Hello also to Analyn and Mark. Jon showed them round the makerspace. They'll be back. MarkW came in to set up the thread cutting drive on the lathe. This involved changing a gear train, which in turn involved making a puller to separate a keyed hub from a small gear. Good job Mark knows what he's doing. By the end of the evening, he'd cut a 1 mm thread in a piece of brass rod. PaulB kept busy in assisting Jane with notch-cutting and later on helping MarkW with the lathe. Jon had something to do on the laser cutter. John brought in a 3D design he had produced and set it to print on the Zombie printer. Made a promising start, but is going to start again next time. Hi to Carl, I hope we see you more often in the coming weeks. Peter seems to have completed his ex-aircraft control panel. It's a complete computer and screen in a box, powered by a Raspberry Pi. (pictured) Awesome! Jane spent her time with geometry and a wood-saw, making two massive triangles. Not a single degree was lost. Thanks to Jon for help and support. Jane also crafted some aluminium pieces. Hi to Phil, joining us today. He has some experience in making things and we hope he'll become a regular. Carla took her designs to the laser cutter. Peter H came along with a rifle stock which he would like to duplicate using the CNC router. Ed had offered his knowledge of modelling in Adobe software and spent several hours converting a photo into a workable 3D file with work-holding fixings, dimensions and everything. (pictured) Without Ed's input it would have taken several weeks or months. Ed is looking for some assistance in crimping plugs on to Cat6 cables. IanB had a try with very little success. He recommends an alternative type of plug and will send Ed a sample. ChrisR came along with a lens that was fixed by a nut inside a long tube. Chris wanted to loosen the nut but it needed a very unusual tool. As we didn't have one, Chris made his own from a piece of scrap, using the bench grinder. It worked and the nut was undone. MartinL got a short tutorial on using N-channel MOSFETs from IanB, and Martin checked out a small elctrically operated hydraulic valve he had brought along. Kevin was re-wiring a 5v portable record player. Didn't get to see it working, hope it was all ok.
Aki used the laser cutter. MartinC continues with that rotary encoder circuit. It has to be a single-sided PCB, to suit Martin's plan for etching. PeterH cut an aluminium die-cast equipment case in half, at home, with an angle grinder. He brought it to Little House to finish the job with a hacksaw and some filing. Garret is making a better mousetrap. Honestly, mice will be queuing up to use it. AndyH tested the limits of the laser cutter and found there is no low limit on the Z axis. It took a couple of hours to get back to the top. But well done for sorting it, Andy. ChrisS showed us a model church and houses which he had 3D printed and painted. Some very fine quality printwork. Hi to Gavin, second visit to us. He waited patiently for the laser cutter to be reinstated then gave a hand in levelling the bed. PaulB gave a swift tutorial in how to (safely) use the laser cutter and Gavin successfully cut out a box design which he had brought. Yas and Leem returned to change the power connector on a Thinkpad. They allowed plenty of time, because it's a tricky operation. With a little help and advice from PaulE, Yas got the connector changed and the Thinkpad has a new lease of life. Plus Yas now has a new skill, knowing how to take apart laptops and more importantly how to put them together again. PaulE worked on a tester, to test a batch of his RS485 voltage level translators. Initially the tests were indicating all devices faulty. After getting the tester right, it became a 100% pass rate. MartinL has taken the small model ekranoplan as far as it can go. Now it may have to be scaled up to develop enough power to lift off the ground. Bogdan was tucked away all evening in the 3D print room. He cleared a blocked hot end with a blowtorch and printed some threaded parts for PLA filament feeds. John came along with an extraordinary red glossy plastic radio from another era. It had a loudspeaker with a broken voice-coil wire. After some attempts to repair it with precision soldering, John found we had a spare loudspeaker of about the right size, so he fitted that instead. Fixed! Good to see PaulB again. He's a busy man domestically these days and has less time for tinkering. Paul helped with sorting out the laser cutter and re-levelling the cut bed. ChrisR used the lathe to make a rod with an M3 thread at one end. No, not thread cutting, but tapping and using a piece of studding. Chris ended up making two of these so if he loses one he'll still be OK.
PeterS looked in to catch up, and shared some ideas with IanB and with Bogdan. MartinC has designed a circuit to connect a rotary encoder to an I2C bus, using a PIC processor. He will create a PCB layout, and then use the laser cutter to help create an etch resist. A novel technique, worth watching as it progresses. AndyH has moved all the 3D printers to the room formerly known as the office, and they are gradually being commissioned. We will document how to use each printer so that everybody who wants to can use one. Andy is also administering the Little House server, and this will be documented in due course. Yas came in, with Leem. Yas has a laptop which we had diagnosed before Christmas as needing a new power inlet connector. IanB showed Yas how to open up the laptop, up to a point, after which we got instructions from YouTube. After a time it became clear that the degree of disassembly needed was excessive (like replacement of the starter motor in a Mercedes-Benz Smart car), so Yas put it back together again to try another day. Dogan stopped by to see what's going on, but didn't stay long. Hi, good to see you again. ChrisS had some laser cutting to do. Jon is expert at many things, and wall fixings are one of his specialities. Today he moved the key safe and fitted a VESA mounting plate, all firm and level, in the room formerly known as the office, now the home of 3D printers. Carla kept busy, but I didn't see at what. Colin came in with a broken wooden chair. ChrisS advised on the best way to apply wood glue to the comb joints. There was no clamp large enough to hold it together while the glue dried, so a rope substitute was used. The whole repair went well. Martin L had diagnosed the problem with the large Mac computer he took away last week, and he brought in a Sky box that needed demolishing. It yielded up a decent size of Hard Disk. Peter helped with the disassembly, having had a few years experience at the place which designed it. Turns out that Yaroslav still works there. Yaroslav had some acrylic disks to cut on the laser cutter. Kevin found a 5v supply and wired it up to a specific plug. This involved soldering and using heat-shrink sleeving, which all went pretty well. Bogdan was still not quite content with the extruder mechanism on the Zombie printer. He modified the mounting which gives the advantage of being able to see the filament passing through it, and giving it a little help if it seems to be following the wrong path. Bogdan left it printing a lid for a Pine single-board computer. Andy successfully made a pegboard on the laser cutter. Jane made a tin boat. Garret replaced the battery on a small scales, tried out a device that made all sorts of noises and further refined his triple mousetrap design. Carla continued with a hand-bound book. This week it reached the glue-and-press stage. Carla investigated what the laser cutter can do for her. Welcome and hello to two new faces this week: PeterK is thinking of starting a tool/workshop sharing base in his own area, and Llewellyn came to see what we offer. He might be back some time soon. PaulE drilled some holes in a part-assembled electronic thingy, and gave IanB advice on working the CNC mill. MartinL reviewed MOSFET connection, and will try to do a factory reset on the Mac in the coming week. Sufiyo dropped in to talk about tidying up the HUG garden tools in our front yard, and putting up a small shed in the corner alcove for storing them safely. Jon and IanB thought it would be a good plan, Andres had earlier given his encouragement, so it's over the the HUG garden people to see what could be done. Bogdan started a 3D print on the Zombie printer, and confirmed that the DeltaMaker 3D printer is operational. He also managed to get Slic3r functional again, as it hadn't been working since moving to its new location. Jon and IanB attended to a fault on the laser cutter, where the red finder beam goes off at certain positions of the x-axis. They replaced a fractured wire and all was well on re-test. MartinL made some attempts to re-animate an old Mac but it didn't want to come back to this world. The story is not yet over, more attempts will be made. Briony called in to offer us some useful empty containers, and brought a large tub of Cadbury Celebrations. Thanks, B. We managed to scoff the lot by the end of the evening. Team effort. Hi to Garret. I didn't see what you were up to today. There's an unexplained decorative double-glazed window under the electronics bench. For recycling, or what? Carl called in about 10.30pm after another long day's work. He's going to do something to Phaedra's bike when he gets time.